The Sombrero Galaxy (also known as Messier Object 104, M104 or NGC 4594) is an unbarred spiral galaxy in the constellation Virgo located 28 million light-years (8.6 Mpc) from Earth. It has a bright nucleus, an unusually large central bulge, and a prominent dust lane in its inclined disk. The dark dust lane and the bulge give this galaxy the appearance of a sombrero. 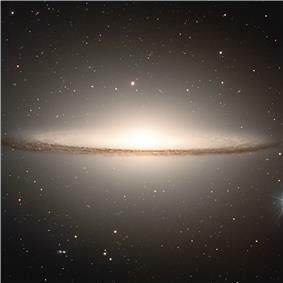 Astronomers initially thought that the halo was small and light, indicative of a spiral galaxy, but Spitzer found that the halo around the Sombrero Galaxy is larger and more massive than previously thought, indicative of a giant elliptical galaxy. The galaxy has an apparent magnitude of +9.0, making it easily visible with amateur telescopes, and it's considered by some authors to be the brightest galaxy within a radius of 10 megaparsecs of the Milky Way. The large bulge, the central supermassive black hole, and the dust lane all attract the attention of professional astronomers. The Sombrero Galaxy was discovered on May 11, 1781 by Pierre Méchain, who described the object in a May 1783 letter to J. Bernoulli that was later published in the Berliner Astronomisches Jahrbuch. Charles Messier made a hand-written note about this and five other objects (now collectively recognized as M104 – M109) to his personal list of objects now known as the Messier Catalogue, but it was not "officially" included until 1921. William Herschel independently discovered the object in 1784 and additionally noted the presence of a "dark stratum" in the galaxy's disc, what is now called a dust lane. Later astronomers were able to connect Méchain's and Herschel's observations. In 1921, Camille Flammarion found Messier's personal list of the Messier objects including the hand-written notes about the Sombrero Galaxy. This was identified with object 4594 in the New General Catalogue, and Flammarion declared that it should be included in the Messier Catalogue. Since this time, the Sombrero Galaxy has been known as M104. As noted above, this galaxy's most striking feature is the dust lane that crosses in front of the bulge of the galaxy. This dust lane is actually a symmetrical ring that encloses the bulge of the galaxy. 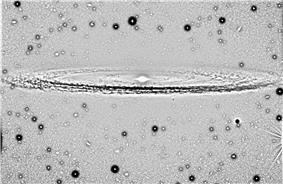 Most of the cold atomic hydrogen gas and the dust lies within this ring. The ring might also contain most of the Sombrero Galaxy's cold molecular gas, although this is an inference based on observations with low resolution and weak detections. 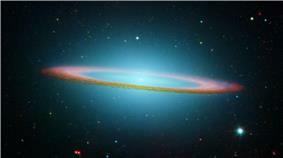 Additional observations are needed to confirm that the Sombrero galaxy's molecular gas is constrained to the ring. Based on infrared spectroscopy, the dust ring is the primary site of star formation within this galaxy. The nucleus of the Sombrero galaxy is classified as a low ionization nuclear emission region (LINER). These are nuclear regions where ionized gas is present, but the ions are only weakly ionized (i.e. the atoms are missing relatively few electrons). The source of energy for ionizing the gas in LINERs has been debated extensively. Some LINER nuclei may be powered by hot, young stars found in star formation regions, whereas other LINER nuclei may be powered by active galactic nuclei (highly energetic regions that contain supermassive black holes). 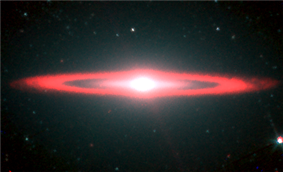 Infrared spectroscopy observations have demonstrated that the nucleus of the Sombrero Galaxy is probably devoid of any significant star formation activity. However, a supermassive black hole has been identified in the nucleus (as discussed in the subsection below), so this active galactic nucleus is probably the energy source that weakly ionizes the gas in the Sombrero Galaxy. At radio and X-ray wavelengths, the nucleus is a strong source of synchrotron emission. Synchrotron emission is produced when high velocity electrons oscillate as they pass through regions with strong magnetic fields. This emission is actually quite common for active galactic nuclei. Although radio synchrotron emission may vary over time for some active galactic nuclei, the luminosity of the radio emission from the Sombrero Galaxy only varies 10-20%. In 2006, two groups published measurements of the submillimeter radiation from the nucleus of the Sombrero Galaxy at a wavelength of 850 µm. This submillimeter emission was found not to originate from the thermal emission from dust (which is commonly seen at infrared and submillimeter wavelengths), synchrotron emission (which is commonly seen at radio wavelengths), bremsstrahlung emission from hot gas (which is uncommonly seen at millimeter wavelengths), or molecular gas (which commonly produces submillimeter spectral lines). The source of the submillimeter emission remains unidentified. The Sombrero Galaxy has a relatively large number of globular clusters. Observational studies of globular clusters in the Sombrero Galaxy have produced estimates of the population in the range of 1,200 to 2,000. The ratio of the number of globular clusters to the total luminosity of the galaxy is high compared to the Milky Way and similar galaxies with small bulges, but the ratio is comparable to other galaxies with large bulges. These results have been repeatedly used to demonstrate that the number of globular clusters in galaxies is thought to be related to the size of the galaxies' bulges. The surface density of the globular clusters generally follows the light profile of the bulge except for near the center of the galaxy. At least two methods have been used to measure the distance to the Sombrero Galaxy. The first method relies on comparing the measured fluxes from planetary nebulae in the Sombrero Galaxy to the known luminosities of planetary nebulae in the Milky Way. This method gave the distance to the Sombrero Galaxy as 29 ± 2 Mly (8,890 ± 610 kpc). The other method used is the surface brightness fluctuations method. This method uses the grainy appearance of the galaxy's bulge to estimate the distance to it. Nearby galaxy bulges will appear very grainy, while more distant bulges will appear smooth. Early measurements using this technique gave distances of 30.6 ± 1.3 Mly (9,380 ± 400 kpc). Later, after some refinement of the technique, a distance of 32 ± 3 Mly (9,810 ± 920 kpc) was measured. This was even further refined in 2003 to be 29.6 ± 2.5 Mly (9,080 ± 770 kpc). The Sombrero Galaxy lies within a complex, filament-like cloud of galaxies that extends to the south of the Virgo Cluster. 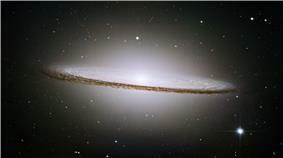 However, it is unclear whether the Sombrero Galaxy is part of a formal galaxy group. Hierarchical methods for identifying groups, which determine group membership by considering whether individual galaxies belong to a larger aggregate of galaxies, typically produce results showing that the Sombrero Galaxy is part of a group that includes NGC 4487, NGC 4504, NGC 4802, UGCA 289, and possibly a few other galaxies. However, results that rely on the percolation method (i.e. the "friends-of-friends" method), which links individual galaxies together to determine group membership, indicate that either the Sombrero Galaxy is not in a group or that it may only be part of a galaxy pair with UGCA 287. The Sombrero Galaxy is located 11.5° west of Spica and 5.5° northeast of Eta Corvi. Although the galaxy is visible with 7x35 binoculars or a 4-inch (100 mm) amateur telescope, an 8-inch (200 mm) telescope is needed to distinguish the bulge from the disk, and a 10-or-12-inch (250 or 300 mm) telescope is needed to see the dark dust lane. The Sombrero Galaxy is on the cover of Clean Code, a software craftsmanship book written by programmer Robert Cecil Martin. There is also a black-and-white photograph of it in the ending credits of each episode of the original version of The Outer Limits. On Jack Arnold's sci-fi 1957 feature film The Incredible Shrinking Man during Grant Williams' final voice-over, the Sombrero Galaxy is among several images that depict his thoughts on the life ahead of him, and the similarities between the infinitely large and the infinitely small. ^ a b H. C. Ford, X. Hui, R. Ciardullo, G. H. Jacoby, K. C. Freeman (1996). 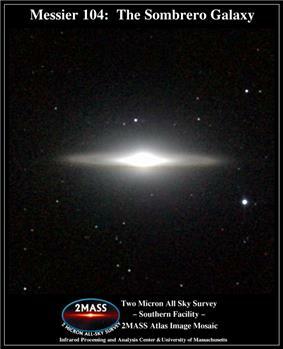 "The Stellar Halo of M104. I. A Survey for Planetary Nebulae and the Planetary Nebula Luminosity Function Distance". ^ a b Jensen, Joseph B.; Tonry, John L.; Barris, Brian J.; Thompson, Rodger I.; Liu, Michael C.; Rieke, Marcia J.; Ajhar, Edward A.; Blakeslee, John P. (2003). "Measuring Distances and Probing the Unresolved Stellar Populations of Galaxies Using Infrared Surface Brightness Fluctuations". ^ a b c d e f g h i j k l m "NASA/IPAC Extragalactic Database". Results for M104. Retrieved 2008-07-09. ^ Karachentsev, Igor D.; Karachentseva, Valentina E.; Huchtmeier, Walter K.; Makarov, Dmitry I. (2003). "A Catalog of Neighboring Galaxies". The Astronomical Journal 127 (4): 2031–2068. ^ a b G. R. Kepple, G. W. Sanner (1998). The Night Sky Observer's Guide. Vol. 2. ^ a b c d e f g h K. G. Jones (1991). Messier's Nebulae and Star Clusters (2nd ed.). ^ a b c d e f g G. J. Bendo, B. A. Buckalew, D. A. Dale, B. T. Draine, R. D. Joseph, R. C. Kennicutt Jr., K. Sheth, J.-D. T. Smith, F. Walter, D. Calzetti, J. M. Cannon, C. W. Engelbracht, K. D. Gordon, G. Helou, D. Hollenbach, E. J. Murphy, H. Roussel (2006). "Spitzer and JCMT Observations of the Active Galactic Nucleus in the Sombrero Galaxy (NGC 4594)". ^ E. Bajaja, G. van der Burg, S. M.; Faber, J. S. Gallagher, G. R. Knapp, W. W. Shane; Van Der Burg; Faber; Gallagher; Knapp; Shane (1984). "The distribution of neutral hydrogen in the Sombrero galaxy, NGC 4594". ^ E. Bajaja, E. Hummel, R. Wielebinski, R.-J. Dettmar; Dettmar; Hummel; Wielebinski (1988). "The large-scale radio continuum structure of the Sombrero galaxy (NGC 4594)". ^ J. S. Young, S. Xie, L. Tacconi, P. Knezek, P. Viscuso, L. Tacconi-Garman, N. Scoville, S. Schneider, F. P. Schloerb, S. Lord, A. Lesser, J. Kenney, Y.-L. Huang, N. Devereux, M. Claussen, J. Case, J. Carpenter, M. Berry, L. Allen (1995). "The FCRAO Extragalactic CO Survey. I. The Data". ^ L. C. Ho, A. V. Filippenko, W. L. W. Sargent (1997). "A Search for "Dwarf" Seyfert Nuclei. III. Spectroscopic Parameters and Properties of the Host Galaxies". ^ a b J. Kormendy, R. Bender, E. A. Ajhar, A. Dressler, S. M. Faber, K. Gebhardt, C. Grillmair, T. R. Lauer, D. Richstone, S. Tremaine (1996). "Hubble Space Telescope Spectroscopic Evidence for a 1 X 10 9 M☉ Black Hole in NGC 4594". ^ a b A. G. de Bruyn, P. C. Crane, R. M. Price, J. B. Carlson; Crane; Price; Carlson (1976). "The radio sources in the nuclei of NGC 3031 and NGC 4594". ^ E. Hummel, J. M. van der Hulst, J. M. Dickey; Van Der Hulst; Dickey (1984). "Central radio sources in spiral galaxies – Starburst or accretion". ^ A. Thean, A. Pedlar, M. J. Kukula, S. A. Baum, C. P. O'Dea (2000). "High-resolution radio observations of Seyfert galaxies in the extended 12-μm sample - I. The observations". ^ T. Di Matteo, C. L. Carilli, A. C. Fabian (2001). "Limits on the Accretion Rates onto Massive Black Holes in Nearby Galaxies". ^ S. Pellegrini, G. Fabbiano, F. Fiore, G. Trinchieri, A. Antonelli (2002). "Nuclear and global X-ray properties of LINER galaxies: Chandra and BeppoSAX results for Sombrero and NGC 4736". ^ S. Pellegrini, A. Baldi, G. Fabbiano, D.-W. Kim (2003). "An XMM-Newton and Chandra Investigation of the Nuclear Accretion in the Sombrero Galaxy (NGC 4594)". ^ a b M. Krause, R. Wielebinski, M. Dumke (2006). "Radio polarization and sub-millimeter observations of the Sombrero galaxy (NGC 4594). Large-scale magnetic field configuration and dust emission". ^ a b K.-I. Wakamatsu (1977). "Radial distribution and total number of globular clusters in M104". ^ W. E. Harris, H. C. Harris, G. L. H. Harris (1984). "Globular clusters in galaxies beyond the local group. III NGC 4594 (the Sombrero)". ^ a b T. J. Bridges, D. A. Hanes (1992). "The globular cluster system of NGC 4594 (the Sombrero)". ^ S. S. Larsen, D. A. Forbes, J. P. Brodie (2001). "Hubble Space Telescope photometry of globular clusters in the Sombrero galaxy". ^ E. A. Ajhar, T. R. Lauer, J. L. Tonry, J. P. Blakeslee, A. Dressler, J. A. Holtzman, M. Postman (1997). "Calibration of the Surface Brightness Fluctution Method for use with the Hubble Space Telescope". ^ J. L. Tonry, A. Dressler, J. P. Blakeslee, E. A. Ajhar, A. B. Fletcher, G. A. Luppino, M. R. Metzger, C. B. Moore (2001). "The SBF Survey of Galaxy Distances. IV. SBF Magnitudes, Colors, and Distances". ^ a b R. B. Tully (1988). Nearby Galaxies Catalog. ^ P. Fouque, E. Gourgoulhon, P. Chamaraux, G. Paturel; Gourgoulhon; Chamaraux; Paturel (1992). "Groups of galaxies within 80 Mpc. II – The catalogue of groups and group members". ^ a b G. Giuricin, C. Marinoni, L. Ceriani, A. Pisani (2000). "Nearby Optical Galaxies: Selection of the Sample and Identification of Groups". ^ A. Garcia (1993). "General study of group membership. II – Determination of nearby groups". ^ a b S. J. O'Meara (1998). The Messier Objects. Bauer, Amanda; Merrifield, Michael. 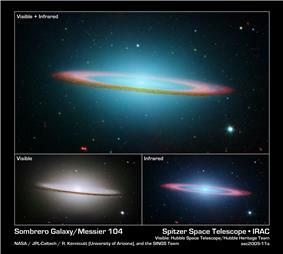 "M104 – Sombrero Galaxy". Deep Space Videos.